Image caption There were more than 14,000 reports of fly-tipping incidents in Bradford in a 12 month period. Litter and fly-tipping in Bradford has been described as a "24/7 problem" by some of the city's residents. As part of the BBC's We Are Bradford project, people asked us to find out how the city is cleaning up its act. There were more than 14,000 reports of fly-tipping in the year up to March 2018, according to government data. That means there were 90 reports for every 1,000 households, making the city as the second worst in the region, behind Leeds. Stephanie Mujati, a 21-year-old university student in the city, said: "Honestly some of the areas are terrible, Bradford is just so dirty. "Some people just leave bags lying around on the side and before you know it, whole alleyways are full of rubbish. "It's really nasty because you know you're gonna be walking, dodging and diving because you have to be mindful of what you're stepping on." Peter Goudie, who lives in Bradford, told us: "A lot of it is general rubbish, mainly household waste. "I think the council needs to do more, they need to be organising events to get more people on board." Image caption Student Stephanie Mujati said parts of Bradford were "terrible"
However Bradford City Council said it was being proactive in encouraging local residents to clean up litter. The authority recently launched its own anti-litter campaign - The Great Bradford Spring Clean - as part of a national campaign run by Keep Britain Tidy. Local residents and businesses were encouraged to go out and pick up litter in their community. "The council just does not have the money to employ a vast army of street cleaners to run round after everyone who dumps litter in our district and we are always keen to work with volunteers to give us a hand where this is possible," a spokesperson said. "By working together, we can make a big difference." Litter Free Baildon was one of the community groups which took part in the campaign. The group, set up in 2016, goes on litter picks almost every weekend and says it has collected more than 1,000 bags of litter from the Baildon area. Image caption Litter Free Baildon said it had collected more than 1,000 bags worth of litter from the Baildon area in Bradford. Dave McDougall, who runs the group, said: "We live in such a beautiful place and it annoys me to see rubbish mindlessly thrown away. "I'm trying to encourage people and local groups to take responsibility for their own patch, for where they live and work." Mr McDougall said a lack of legal enforcement was one of the main reasons the issue was so prevalent and more schemes were needed to tackle the problem. 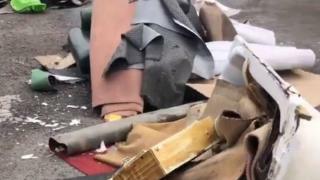 However, the council said the number of legal enforcement procedures against fly-tippers "compares favourably with neighbouring local authorities". "All incidents of fly-tipping are investigated by Bradford Council to try to identify anything among the rubbish which can indicate its source," the spokesman added. "Bradford Council employs a range of measures to tackle fly-tipping including CCTV cameras to catch the culprits, fixed penalty notices, criminal prosecutions in the magistrates' and crown courts as well as seizing vehicles known to be involved in fly-tipping." This article was created as part of We Are Bradford - a BBC project with the people of the city to tell the stories which matter to them. Have you got a story from Bradford or a question about the city you'd like us to answer? You can submit suggestions using the tool below.